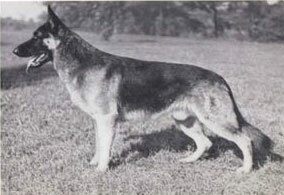 "Ch Garry of Benlore was a beautifully balanced dog, so far ahead of his time. Note the natural picture, taken in his own yard. He had exceptional front, strong pasterns and feet, good back and croup and balance." Garry was 25 inches tall, 31 inches long and weight 95 pounds. ~ Ad in The German Shepherd Dog in Review.